The handling of wet pulp samples presents a problem to every ore dressing and metallurgical laboratory. The use of proper size and type filters with required vacuum equipment will simply and efficiently eliminate many of the difficulties. 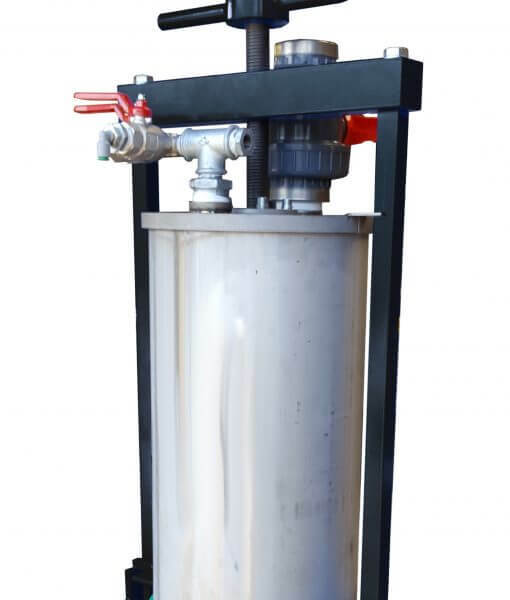 Laboratory Vacuum Filter is available for all sizes of laboratories and continuous pilot test plants. 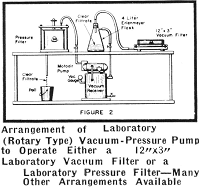 Necessary units for any capacity laboratory vacuum system are available and arrangements for individual or interdependent vacuum-pressure systems have been developed to meet the practical needs of research, commercial, and private laboratories. A combination vacuum-pressure unit such as the Laboratory (Rotary Type) Vacuum-Pressure Pump is recommended for the average laboratory. 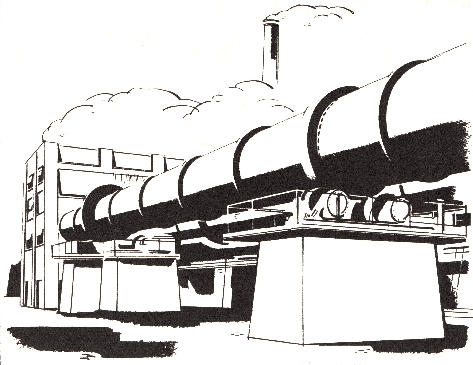 The application of this unit and a suggested arrangement for its use is shown in the illustration above. Although one pump can be, and generally is, used for operating both vacuum and pressure filtering equipment; only one system or the other should be in operation at any one time. This pump has a displacement of 3 to 4 cubic feet of free air per minute and will maintain a vacuum of 20 to 25 inches of mercury column or a pressure of 20 pounds per square inch. This is sufficient for satisfactory operation of the Laboratory Vacuum Filter or the Laboratory Pressure Filter when using either one or the other of the systems in the arrangement illustrated. The Laboratory (Non-Lubricated Cylinder) Vacuum-Pressure Pump is ideal for use as a small compressor or vacuum pump with a clean, oil-free discharge. As a compressor, piston displacement is from 8 to 11 cubic feet per minute; and as a vacuum pump, a vacuum of 27 inches of mercury can be maintained. For laboratories requiring more free air displacement with higher pressures and vacuum, the Laboratory (Piston Type) Vacuum-Pressure Pump is an ideal unit. 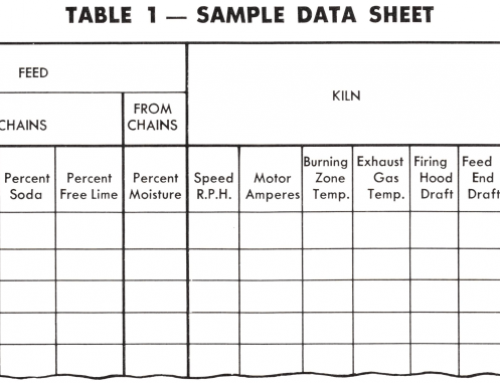 In addition to operating filters, pressure or vacuum may be required in connection with laboratory devices such as air lifts, agitators, and also for air cleaning of crushing equipment. As much as 40 pounds pressure may be supplied by this pump, and piston displacement range is from 9 to 32 cubic feet per minute. A vacuum giving only 1 inch of mercury barometer can be maintained. A piston type pump, when it is to be used for both pressure and vacuum, should be specified as a compressor. Vacuum receivers and pressure tanks equipped with gauges and other accessory items are available. Recommended, compact, efficient, arrangement plans for your laboratory vacuum or vacuum-pressure system will be supplied on request. Let us engineer a system to suit your needs. FILTER, Batch, Vacuum, —When speed is essential, a laboratory filter is an important piece of equipment. Mill samples and test pulps are quickly dewatered by means of a simple and easy process with the Vacuum Filter. Two castings comprise the unit. 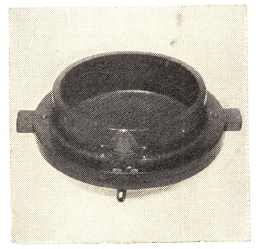 The base has an opening for a vacuum connection, and the top casting holds the pulp. 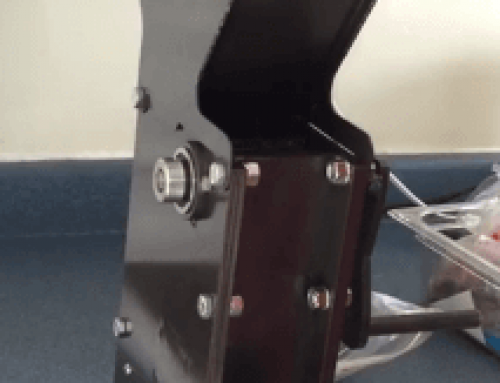 Most important of all, the filter medium is held tightly between the two castings merely by dowel pins, which eliminate the use of clamps or thumb screws. Calculations are greatly simplified by the filter area, which is one-half square foot. FILTER, Batch, Pressure—Too often test work is neglected or handicapped by insuffi­cient facilities in handling products. Instead of running four or five tests each day it is often impossible to run more than one because of the difficulty of decanting and drying the products. The Laboratory Pressure Filter was designed to quickly filter various products. 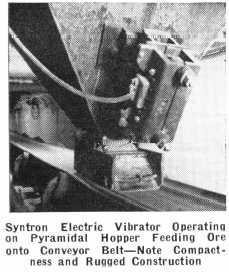 By means of an ingenious arrangement of the yoke it is impossible to open the filter without first releasing the air pressure. 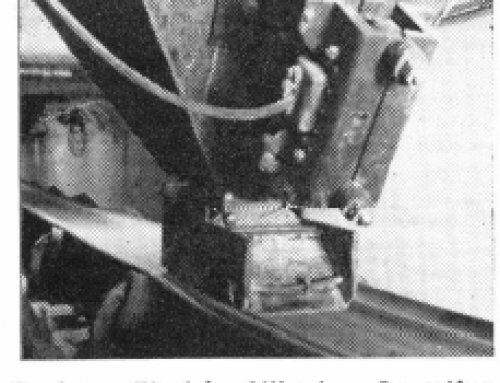 The air pressure line projects through the yoke, making it impossible to re­move the yoke until the “Quick as a Wink” connection is first severed. 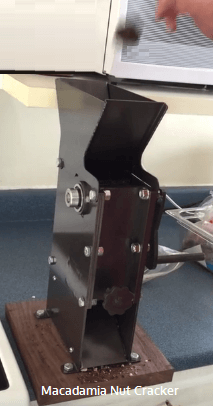 This “Safety” pressure type of filter is very desirable for use in universities and schools as well as for test plant labo­ratory filtering. The filter is made in three sizes, 6, 8 and 10 inch diameter. It may be used for vacuum as well as pressure work. 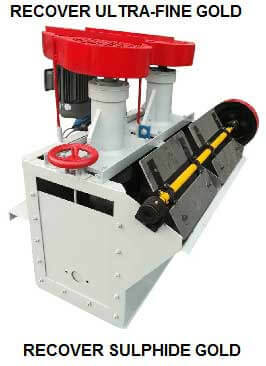 The 10 inch size can easily handle more than a bucket of pulp at one filtering operation. Diameter, 12 inches. Filter area, 0.80 sq. ft. Volume in gallons, 5.95. Shipping weight, 408 pounds; net weight, 328 pounds. Boxed dimensions, 19x36x37 inches. 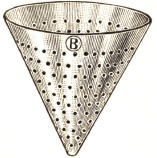 FILTER CONE, Porcelain, Coors-Glazed inside and outside, with exception of rim. FILTER PAPER, White-For qualitative work. A high-grade, smooth surface filter paper of close texture. Especially recommended for students’ requirements and general qualitative analysis. FILTER PAPER, Gray No. 226-For qualitative work. A rapid filtering, crepe surface paper of open texture. Of very high quality. FILTER PAPER, Munktells No. 00-For special scientific work. Washed in hydrochloric and hydrofluoric acids. This is a high-grade paper for the most exacting work. FILTER PAPER, Munktells No. 1F-A very strong paper, retaining the finest precipitates. Lowest ash content of the unwashed Munktells filter papers. Adapted to highest class of chemical work. FILTER PAPER, S. & S. No. 597-A high-grade paper of medium thickness, pure white and perfectly clean. A very good paper for general qualitative analysis. FILTER PAPER, Whatman No. 30-Single washed in hydrochloric acid. 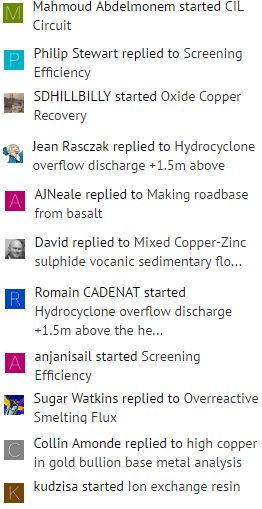 Retentive and fairly rapid. For use in the determination of phosphorus, barium sulphate, and general quantitative work. FILTER PAPER, Whatman No. 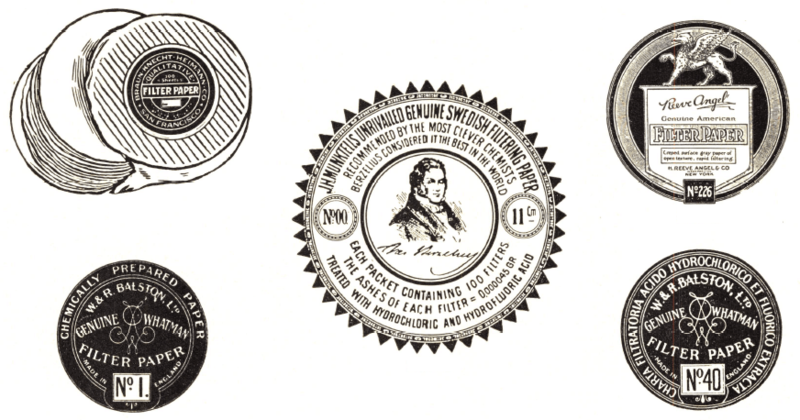 40-Double washed in hydrochloric and hydrofluoric acids. Filters rapidly, very low in ash and retains fine precipitates. Recommend for general quantitative work.